Authorities in the southern Chinese province of Guangdong have fired tear gas at protesters angry over plans to build a waste incinerator plant near their homes amid violent clashes that continued on Monday, local residents said. 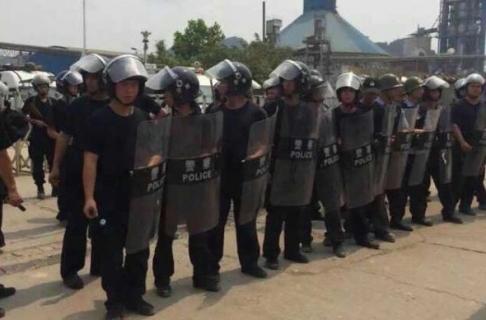 Around 1,000 police in full riot gear were dispatched on Sunday to Jinzao township near the coastal city of Shantou in the east of Guangdong after residents of several dozen villages began a mass protest at the planned plant. “Everyone is against this; there isn’t a single person here who agrees with the plan to build a waste plant, otherwise we wouldn’t be causing trouble,” she said. “Things got pretty serious in Village No. 11, which is in the mountains … right where they were planning to build the waste incinerator plant,” Cai said. Protesters on Monday threw rocks and stones at riot police, smashing police vehicles, a second local resident told RFA. “There were a lot of people here in the morning, throwing stones and suchlike,” the resident, who gave only a surname, Liu, said. Local residents tweeted that the police had fired tear gas canisters in an “offensive” on the villages near the planned site. Dozens of people were injured and an unknown number detained, according to tweets from the scene. “Some people can’t get out of their homes, and there are drones in the sky above shooting footage of people’s movements,” the tweet said. Local officials moved ahead with the planned project without the consent of local people, in a dispute that has dragged on for nearly two years, villagers said. An official who answered the phone at the Jinzao township government offices on Monday said all was now quiet in the area. Some 20,000 local residents, who staged a mass demonstration last January, remain totally opposed to the project, which they fear will damage their health and pollute local soil and water supplies. More than three decades of breakneck economic growth have left Guangdong with a seriously degraded environment, causing a fast-maturing environmental movement to emerge among the region’s middle classes and farming communities alike. Last year, authorities in Guangdong’s Puzhai township said they would cancel plans to build a waste-incineration plant there following angry protests and violent clashes between demonstrators and police. Reported by Ka Pa and Wei Ling for RFA’s Cantonese Service. Translated and written in English by Luisetta Mudie. 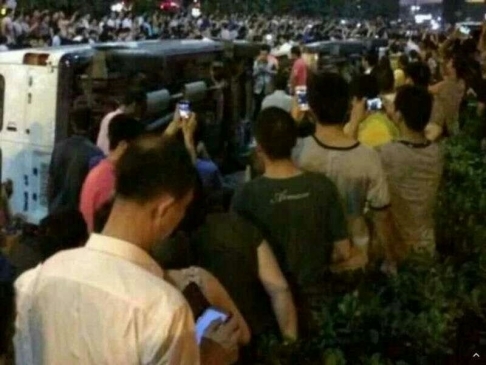 A western Guangdong city has cancelled a plan to build an incinerator that prompted a protest – of up to 10,000 people on some accounts – during which three police cars were flipped and a duty office vandalised. Luoding city government posted two letters on its website on Wednesday announcing the decision. One informed the Langtang township government that it had decided to cancel the project, which Langtang had brokered with China Resources Cement Holdings. The second urged residents to stop blocking roads, vandalising property or disturbing public order. The decision came after residents of the town engaged in a defiant stand-off with police on Tuesday, in protest against what they said was the violent handling of a peaceful sit-in against the incinerator on Monday. Residents said about 1,000 locals turned up to Monday’s sit-in, which took place outside a cement factory owned by China Resources. They claim demonstrators were beaten by more than 100 men dressed in black and armed with batons, helmets and shields. They say the men were a mix of policemen and security guards. “My nephew is only 14 and is suffering from concussion after he was beaten by the men with batons,” said one resident. The clash at Monday’s sit-in protest triggered the larger protest on Tuesday, which residents say involved about 10,000 locals. 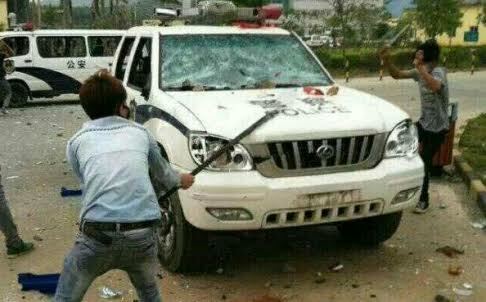 Luoding city government claimed only 400 residents had taken part in Tuesday’s standoff and denied any had been injured. It said on Monday “a small number of troublemakers instigated the crowd” to block roads and throw rocks at factory staff. Police arrested the “troublemakers” but 400 others gathered the next day, with some throwing rocks and glass bottles and vandalising police cars and the duty office, it said.